In the twenty years since, Somerville Open Studios (SOS) has grown to become one of the largest events of its kind in the country with over 400 participating artists displaying their work every spring. In 2001, we introduced the first SOS online artist directory to allow visitors to better plan their tour by previewing artist work online. In 2002, the first Artist’s Choice exhibit (now called the SOS First Look show) was held at the Somerville Museum to give visitors a further opportunity to see a wide selection of Somerville artists’ work in a single venue. 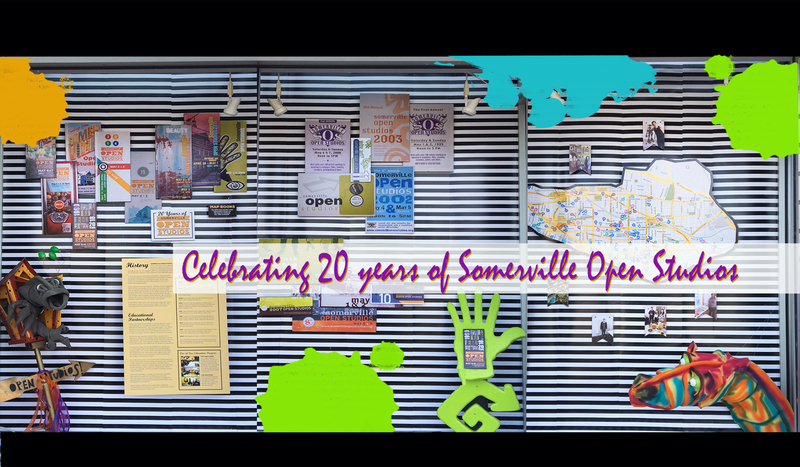 In 2004, Somerville Open Studios became a Massachusetts non-profit organization established for the purpose of providing access to artists and exposing the public to the wide variety of art-making activities taking place in the city of Somerville, Massachusetts. Starting in 2010, SOS has placed a display each spring in the Somerville Arts Council's Inside-OUT Gallery, which is located in the windows of the Davis Square CVS. The Volunteers that make SOS happen got a special group show dedicated to their work, starting in SOS of 2011. In SOS of 2012, a group of Somerville clothing designers and creators approached SOS to launch the first SOS runway Fashion Show, Beyond The Pattern. Likewise Somerville Community Access Television coordinated an SOS Film Festival to run in conjunction with SOS. Each of these initiatives have brought more attention to the deep and diverse arts community that thrives in the City of Somerville. In 2012, SOS also for the first time expanded to three days, with some artists opting to open their studios for three hours on Friday evening. Starting in 2013, SOS has presented a Kids' Art Show in the Armory Cafe. While experiencing steady growth, we have striven to keep the event inclusive and diverse. In this spirit, we welcome artists who are exhibiting for the first time to show next to established professionals. We work hard to make a place for artists working out of their home studios as well as those who are part of large studio buildings. While doing this we continue to look for new ways to build community and make connections between visual artists and the people of Somerville. Somerville Open Studios is managed by a Board of Directors comprised of participating artists. An Open Studios executive committee is formed each year to organize the event. This committee is assisted by many dedicated volunteers.